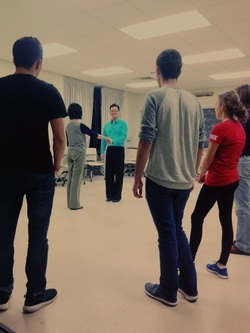 On weekdays during Fall & Spring semesters, BAM offers lesson series for a variety of dances during the semester. Each series meets for 2 or 3 weeks, and the instructor will review what you learned the previous week before continuing with the next lesson. You never need to bring a partner as we change partners often throughout the lesson. You do not have to be a member of BAM to attend the lessons. However, you can join at the lesson to receive a discounted price for the class. Just arrive a few minutes early to join the club. (Membership Details). Are you taking a ballroom class at the UW Dance Department this semester? If so, we provide a dance participation credit slip for each lesson. We write "Lesson" on the slip and it is up to your professor to decide whether it counts as credit for your class. We also provide credit slips at our weekend lessons and dances. This also applies to our pre-dance lessons (see below). 3-Week Viennese Waltz Lesson Series! Before most of our weekend dances, we offer a 6:30pm intermediate lesson followed by a 7:15pm beginner lesson before the general social dance starts at 8:00pm. Even though the pre-dance lessons are for a single genre each week, we always play a mix of dance genres at the social dance starting at 8:00. If you are a BAM member, these pre-dance lessons are free! Just show your membership card as you arrive (if you have lost your card, we can look up your membership). Non-members may take the pre-dance lessons for $5. If you pay $5 for the intermediate lesson, you can stay for the beginner level lesson without having to pay an additional $5. For more upcoming pre-dance lessons, see our dance schedule.